Lefkada is the only island in the Ionian Sea that is accessible by car from the mainland. Due to its short distance from the shore of Akarnania in central Greece, the island is linked to the mainland with a 50 metre bridge. The free pass of the bridge makes visiting Lefkada by car even more tempting. There are different ways to drive to the island depending on where you are travelling from. If you are heading to Lefkada from the north of Greece, the Balkans or eastern Europe, then you’ll have to drive the newly constructed Egnatia Highway all the way to Ioannina where you exit it. From Ioannina exit you drive to Preveza where you cross the underwater tunnel of Aktio. Unfortunately, it isn’t possible to admire the life underwater when you are in the tunnel, but it is still the most convenient way to reach the island. When you exit the tunnel, you need to drive 20 kilometres more before you arrive in Lefkada Town. If you are travelling from the South, then you will have to cross the large bridge of Rio-Antirio. The tolls there might be quite expensive, but there are no more tolls after the bridge and all the way to the island. You could try the old mountainous roads if you want to avoid the tolls, but we highly recommend crossing the bridge as this is the fastest, but more importantly the safest way from Athens and anywhere in the south. The island is accessible by ship and plane as well. Ferries depart from most of the major ports in the east coast of Italy to the ports of Igoumenitsa in the north and Patras in the south. After you arrive there, you can either take the bus (KTEL) to Lefkada or drive to the island as instructed above. If you would like to travel by plane, during the summer months there are usually chartered flights to the airport in Preveza (Aktio), but we advise you check the availability of flights well beforehand. From the airport you will have to rent a car or take the KTEL bus to Lefkada once again. In case, you can't find any flights to Preveza airport, there is always the option to fly to Athens or Thessaloniki airports which are connected with frequent flights from all over the world. 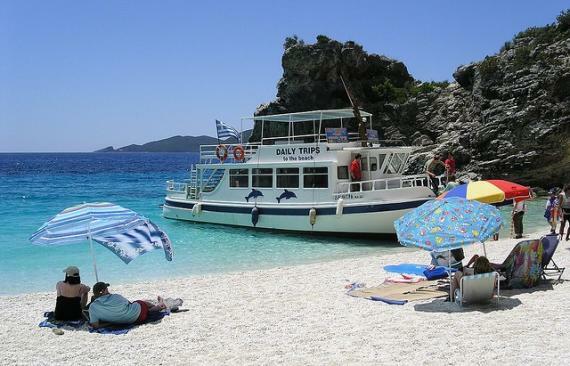 The bus journey to Lefkada from both cities takes approximately 5 hours. Nearby airports with frequent chartered flights from overseas are those on Corfu, Kefalonia and Zakynthos. From there, you can take the ferry to Nidri or Vassiliki, Lefkada. Useful phones: Preveza (Aktio) airport, Tel: 003026820-22089.25474. KTEL Kifissos, Athens, Tel: 0030210-5150108, KTEL Lefkada, Tel: 003026450-22364.